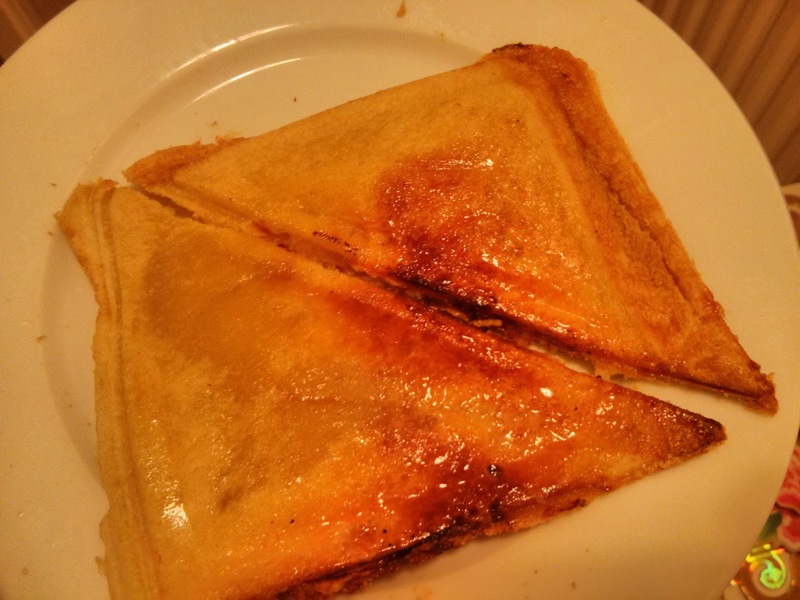 The more I thought about toasted sandwiches, the more combinations I realised were possible. In fact, perhaps the £5 toasted sandwich maker is the only cooking equipment you really need to own! Here are three dessert ideas - whether you're an impoverished student, a brave food adventurer, or just a twisted wierdo like me. 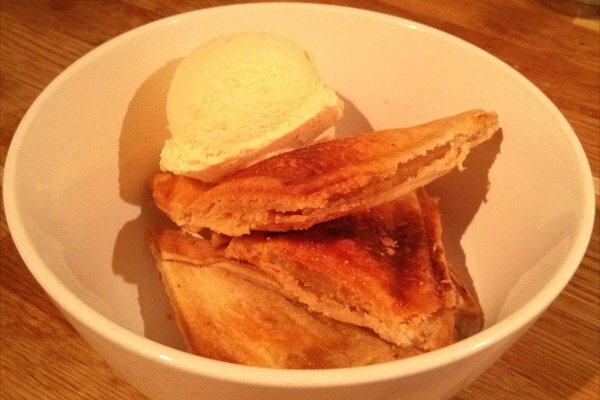 My first dessert toastie was apple pie themed. 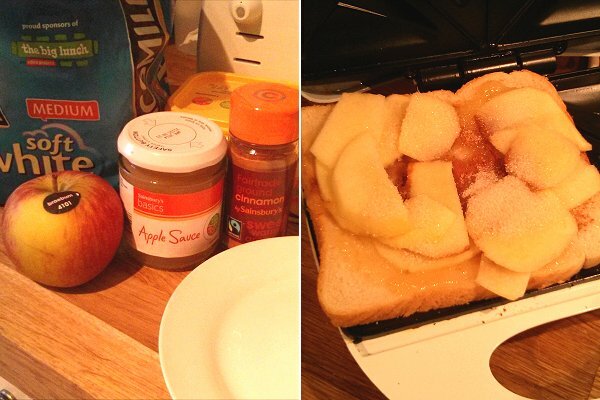 Apple sauce and slices of apple, sprinkled with sugar and cinnamon. As an experiment, I removed the sandwich halfway through cooking, coated it with butter and sugar, and put it back in the toasting device. This created a rather pleasing sticky coating. 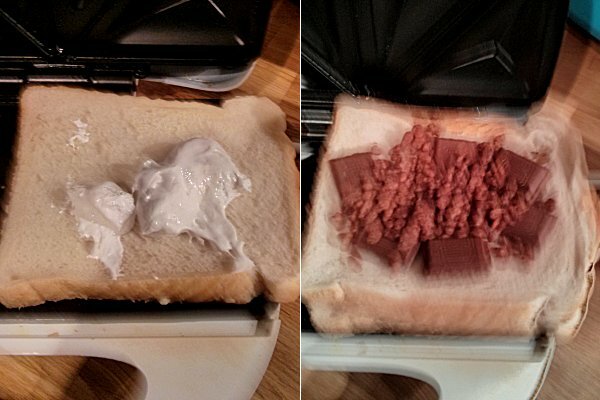 It almost ruined the sandwich toaster, but I think it was worth it. The first dessert sandwich was a resounding success. I was wondering whether a two-layer toastie would be practical, and if so, what fillings I should use. 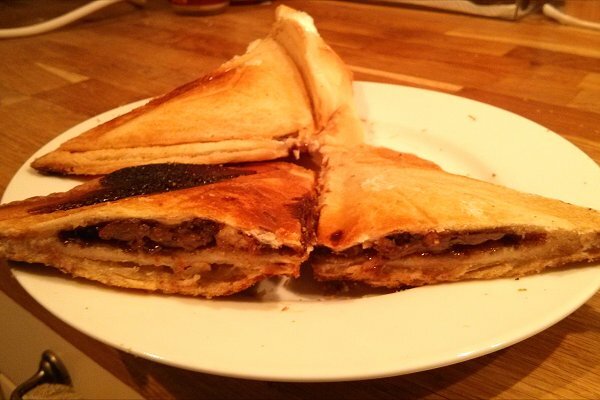 Well, how about a double decker toastie - based on the chocolate bar of the same name? 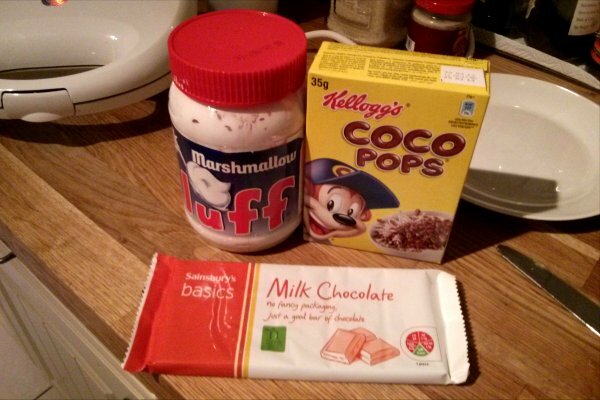 Marshmallow fluff on the bottom (in lieu of nougat), chocolate and coco pops on the top layer, and an extra slice of bread in between. OK, so the photos are a little blurry... I'd had a couple of drinks at this point. To be honest you need a little sharpener before tackling something like this. But I'm pleased to say that the twin layer toastie actually worked pretty well! 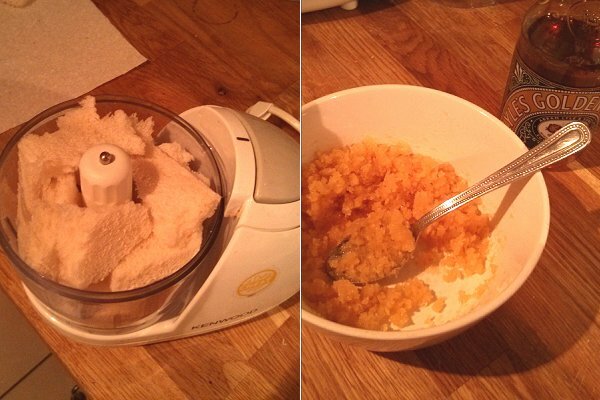 After making the breadcrumbs in a blender, I mixed in the syrup, and proceeded to make the sandwich. Just for fun, I turned the sandwich round halfway through cooking, to create four small triangles instead of the standard pattern. And I must say, it turned out pretty well. And it went down a treat with a scoop of ice cream.